Citing a new study that calculated the “intrinsic valuations” of every football program in the top tier of the FBS, the Wall Street Journal reports that Auburn football is the 6th most valuable team in the country. So what’s the asking price for the Auburn Tigers? Just over 508 million dollars. But if you’re looking for something a little cheaper, try the Crimson Tide, which was valued at a PAWWWLLLtry 476 million. 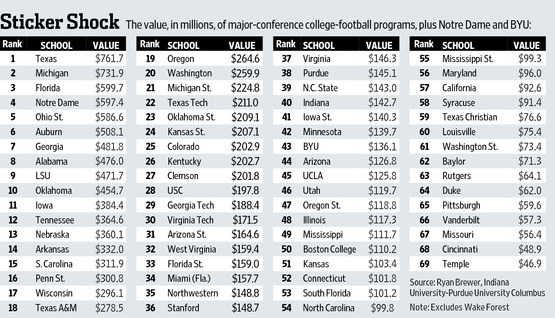 I’m a lifelong Auburn fan/alumnus, and even I find it hard to believe that we would be worth more than Bama and UGA. But, what do I know? I know. But it’s science, so. This is great! War Eagle! After further inspection, they’re trying to tell me Kentucky’s football program – KENTUCKY – is worth more than USC, VA Tech, and FSU? I’d like to see all of their metrics. And I promise, I’m not trying to be that guy. HRT, Due to the SEC’s lucrative TV money, Kentucky pulls in more money than any team in the ACC, and close to what SoCal gets through their healthy Pac12 TV deals. But since the article is trying to assign future projections, the SEC’s pending TV contract re-negotiations could be increasing Kentucky’s valuation. The real issue to me is why are Vandy, Ole Miss, Miss State, and Missouri so low. I am not here to start a fight. So, please don’t shoot the messenger. Is this, an indicator that Jay Jacobs is doing a good job on the financial side of Auburn athletics? It’s an honest question. After hearing all the “we have to fire Jay” comments this past December, I was wondering if this would change some opinions. A promising aspect of these numbers is that the state of Alabama’s football programs are valued in the highest, only second to the state of Texas. Considering the amount of established football programs in the state of Texas, plus population, versus our two colleges and small population, we are doing fantastic! I’m thinking AU ranking over UA has to do with the “growth projections” part of the analysis…there’s a lot more potential for converting people to Au fans. If I’m buying a pro team, I want to buy a team who’s best days are ahead. Buying bama is just buying a bunch of ungrateful pissed off fans when the don’t win the natty every year..